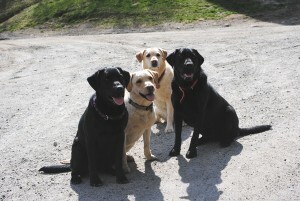 We invite you and your dogs to visit our pet-friendly outdoor resort in Millinocket, Maine. We believe that when you go on vacation, whether it’s a Maine whitewater rafting vacation or another outdoor adventure vacation, you shouldn’t have to leave a part of the family at home. We want all our guests (two legged and four legged) to enjoy their time at our resort. However, we do ask you to follow a few simple rules. Twin Pines Camps Cabins; Small, Large, Premium and Coveside Guest Houses. Penobscot Outdoor Center; camping, cabin tents, bunkhouses. Due to barking, damage and summer heat, you may not leave your dog unattended unless in a kennel. Please keep cabins clean after your dog goes swimming, walking, etc. A $200 security deposit is required (we provide you with a clean dog bed and bowls). If you fail to register your pet with us – there is a $250 fee for unregistered pets. For all other pets, please inquire before making your reservation arrangements. During your stay, if your pet needs medical attention or you would like some quality alone time there are local facilities in the area that can help.